If you want your cocktails brought to your conversation pit by young ladies in miniskirts, to ogle the Beautiful People and enjoy an expansive bird’s-eye view of Downtown Tallahassee, by all means, take the elevator to Hotel Duval’s Level 8. But stay on the ground floor and you’ll find a very different, more low-key experience in the hotel’s best kept secret — the lounge at Shula’s 347 Grill. The bar, tucked away behind a frosted glass window as you enter the steakhouse, seats only 12 people (the bar staff serves another 12 people at traditional tables nearby). The atmosphere is classic — lots of wood paneling and a wide assortment of scotches, single malts, whiskeys and wines — cozy and, for the most part, quiet. The bar attracts a more mature crowd, including traveling business people who want to enjoy something to eat. From a Crispy Ravioli appetizer to a 14-ounce Shula Cut Rib Eye, the entire Shula’s menu is available to patrons. Ask bartender Jeremiah Elliott to suggest a drink and he’s going to direct you to Shula’s Signature Cocktail menu, which includes all the classics, “with a twist,” he says. He suggests Shula’s take on the whiskey sour, the Signature 25, which pairs Knob Creek bourbon with a homemade sour mix, and the less-traditional addition of Agavero Orange liqueur and bitters. His personal favorite is the gin-and-lemon-flavored classic, a Tom Collins, which he often tops off with Sprite rather than the traditional club soda. “I’m a sweet kind of guy,” the 26-year-old admits. 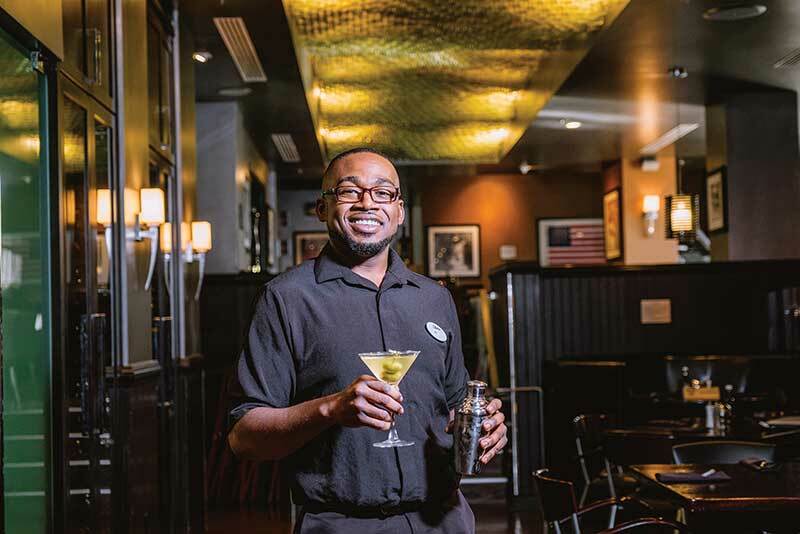 The soft-spoken Tallahassee native started working at Shula’s five years ago as a line cook, graduated to food running and waiting tables, and went behind the bar a year and a half ago. As a rookie, Elliott would refer to recipes written on a set of laminated 4-by-6-inch index cards that are kind of sticky. “There’s a lot of simple syrup and bitters flying around here,” he explains. But even the most classic of cocktails involve communication between bartender and patron, says Elliott. Ask for your martini “dirty” and you’ll get a splash of olive juice in your drink. “Filthy” will get you even more. Olives come regular and stuffed with blue cheese. Or you can get “a twist” of lemon. A cocktail onion garnish transforms the drink into a Gibson. And then there’s the whole “dry versus wet” situation, which refers to the amount of vermouth in the drink. Simply put, “dry” means a splash of vermouth. Elliott swishes the flavorful fortified wine in a glass and then dumps out what’s left to make a dry martini. For an “extra dry” martini, he uses no vermouth at all. “People come here and they’re like, ‘I want it very, very, very dry.’ I get so confused at that point, I have to ask them ‘vermouth or no vermouth,’” Elliott says. He would also like to remind us that a martini features 3 ounces of liquor, twice that of a standard cocktail, something to keep in mind when pacing one’s drinking. Fill a small cocktail shaker with ice. Add vodka and olive juice and shake vigorously for a few seconds. Strain into a pre-chilled martini glass. Garnish with olives on a cocktail pick.